The MRS tank farm in Tin Can Island is on fire following a massive explosion that rocked the sprawling facility in Apapa, Lagos, an explosion which emanated from an oil vessel. 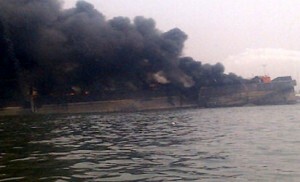 Confirming the incidence, official of the National Emergency Management Agency (NEMA) said a fuel tanker caught fire after exploding at the Tin Can Island port in Apapa area of Lagos. Fire Service and other Concerned Authorities should please be alerted. Could Nigeria Ex Military Leader Ibrahim Badamasi Babangida be serious ?